The Rockwood Signature Ultra Lite fifth-wheel is shown with an optional white exterior; the standard color is Champagne. This towable RV from a division of Forest River provides a full array of amenities and construction features in a lighter-weight package. 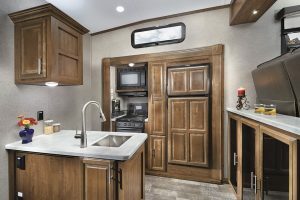 Last year, RV shows throughout North America drew sizable crowds, and the trend has continued into 2019. Among the industry’s major players is Forest River Inc., manufacturer of motorhomes, towable RVs, and numerous other vehicles. The company’s Rockwood travel trailers and fifth-wheels have garnered considerable interest, according to Forest River officials. Take the Rockwood Signature Ultra Lite fifth-wheel. As its name suggests, this model can be paired with most ½-ton pickup trucks. With its LCI Turning Point pin box hitch, the Signature Ultra Lite can be towed on almost any size truck bed, according to company literature. For RVers with trucks that have more limited towing capabilities, this lighter-weight alternative may fit the bill. How light is the Signature Ultra Lite? The unloaded vehicle weight (UVW) ranges from 9,505 pounds to 10,072 pounds. Hitch weights run from 1,550 to 1,637 pounds. Each unit is 96 inches wide and has an exterior height of 13 feet, including the roof air conditioner. Vehicle lengths range from 34 feet 1 inch to 36 feet 7 inches. Rockwood RVs incorporate a surface-coated, steel I-beam frame. The Signature Ultra Lite features Dexter Torflex Torsion Axles with independent wheel suspension and self-damping action, which eliminates metal-to-metal contact, plus easy-lube wheel bearings and Nev-R-Adjust brakes. Power stabilizer jacks or the one-touch self-leveling system are optional. 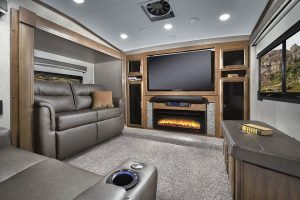 In the 8297S floor plan, the living area is up front and contains a wall-length entertainment center with a 55-inch LCD TV and Bluetooth technology, among other features. Leather-look upholstery covers theater seating and a sofa bed. Rockwood is one of only a handful of companies that employ fully aluminum framing on all six sides of the RV. The floor; roof; front; rear; and exterior walls feature vacuum-bonded lamination for structural strength and improved insulation. (Insulation factors: R-7, sidewalls; R-12, floor; and R-14, roof.) The 4-inch-thick roof incorporates a one-piece, seamless TPO membrane; it is radiused and vaulted for increased interior height. Insulated A/C ducts are built into the structure. Standard “Champagne”-color high-gloss fiberglass walls are constructed in Rockwood’s state-of-the-art lamination facility. For those who prefer a white exterior, it is available as an option. The front cap also features high-gloss fiberglass; recently, two-tone fiberglass front caps were introduced for 2019. Black exterior trim and decorative frame skirting add a bit of character as well. Down below, an enclosed underbelly protects components and is said to improve the RV’s aerodynamics. The RV’s holding tanks are equipped with thermostatically controlled 12-volt heat pads; this eliminates having to run the furnace to keep the tanks warm while traveling. Tinted, bonded, frameless windows come standard on the Signature Ultra Lite; for those who prefer, optional thermo-pane windows are available. MORryde strut-assist fold-out entry steps; an exterior shower; a propane-powered grill and work table out the back; and a mini outside kitchen on most models are among other standard features. Convenient pass-through storage is provided on most models, along with under-bed storage and front “trunk” storage. Each Signature Ultra Lite fifth-wheel comes with a power awning that includes an LED lighting strip and an adjustable rain dump feature. One enters the RV through a 76-inch-by-30-inch front door. Company literature states that larger floor plans are being offered for 2019. Even so, visually the interior appears spacious, thanks to a lighter décor. Floor coverings and fabric/upholstery patterns are comfortably muted and are enhanced by Shaker-style, Slatewood-colored cabinetry, which comes standard, or by optional raised-panel American Maple cabinetry. The solid-wood doors and drawers feature upgraded hardware; the drawers close smoothly with full-extension soft-close guides. Two fabric palettes are offered as well: Chocolate and Pebble. Flush-mount 12-volt ceiling lights can be controlled via multiple switches. Day/night pull shades come standard, but optional day/night roller shades may be substituted. The Signature Ultra Lite 8297S displays the optional American Maple cabinetry and Chocolate fabric palette. Galley features include solid-surface countertops and an under-mount sink, along with a microwave oven, a gas oven, and a three-burner stove. The 8297S floor plan is a nice representation of the Signature Ultra Lite line. However, it is the only one to feature a rear bedroom, which is made private via a sliding pocket door. The queen-size bed with Serta mattress, ensconced in the head of the street-side slideout, may be substituted with a king-size bed if RVers prefer. Carpeting runs through the bedroom and living area; rubberized linoleum covers the remainder, in tandem with composite wood-look steps. In the 8297S, one of these steps leads from the rear bedroom to a hall, and another into the street-side bath. The bath area contains a residential-style porcelain foot-flush toilet and a shower with a radius glass door. A water conservation device on the latter, the Shower Miser Water Saver System, replaces the standard temperature-control faucet. It recirculates cold water back into the fresh-water tank, and indicates when hot water is available. The 8297S has a 60-gallon fresh-water tank and gray- and black-water tank capacities of 90 gallons and 45 gallons, respectively. Signature Ultra Lite models include a six-gallon, quick-recovery, auto-ignition water heater that can be powered via propane or electric. Various galley configurations available throughout the model line should satisfy most cooks — and diners. The latter can relax at the standard dinette or the optional freestanding table and chairs (the chairs feature under-seat storage, similar to that of a piano bench). Under each dinette bench, an extra-large drawer makes a convenient storage spot. Refrigerators range from a 9-cubic-foot gas-electric model to an optional 22-cubic-foot residential refrigerator with inverter. Cooking appliances include a microwave oven, a 22-inch gas oven, and a three-burner stove with a glass cooktop cover. Flush-mount stainless-steel sinks are paired with high-rise lift-off faucets installed on solid-surface Samson countertops. 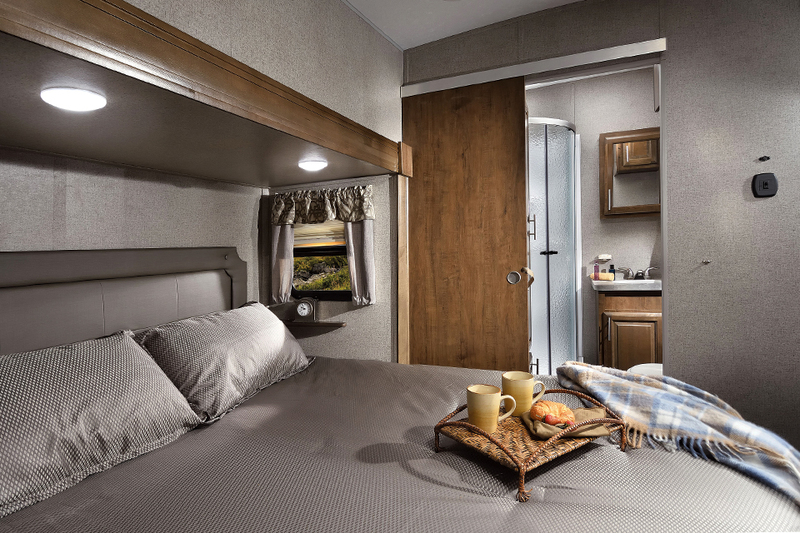 The bedroom in the Signature Ultra Lite 8297S, located in the rear, places the head of the bed in the street-side slideout. A queen-size bed comes standard, with a king-size bed offered as an option. Just ahead is the bath area, also on the street side, which includes a shower with a radius glass door. Lounging is a comfortable pastime in these RVs. The 8297S has a slim “kitchen bar” atop smoked-glass-fronted cabinets, which looks up into the front living area, accessible via several steps. Stylish theater seating and a sleeper sofa, upholstered with leather-look vinyl, are perpendicular to each other. Other floor plans incorporate tri-fold sofa beds and swiveling rocker-recliners. The showstopper in this area is the wall-length entertainment center with Bluetooth technology. A generously sized 55-inch LCD TV and an upgraded sound bar speaker system can make every night “movie night.” A multizone stereo is paired with DVD/CD/Blu-ray/AM/FM and more. Cabinets flank the TV, and a fireplace below creates a nice ambience. All Signature Ultra Lite floor plans contain the entertainment area, albeit in different configurations. Electrical requirements in this fifth-wheel are handled via 50-amp service, along with a 55-amp converter with charger. Cooling needs are met by a 13,500-Btu ducted air-conditioner or optional 15,000-Btu ducted roof unit. The vehicles are prepped for an optional second A/C unit if desired. A 35,000-Btu floor-ducted furnace warms the interior. If this sampling of features is any indication, the Signature Ultra Lite fifth-wheel fosters comfortable travel in a fully equipped RV, without the need for massive towing power.